Welcome to History Gallery! We specialize in paper memorabilia of American history, including graphical items that you can read, collect or proudly hang on your wall. Product categories are shown on the top of every page. Bound 1776 Gentleman's Magazine with very early August 1776 publication of Declaration of Independence, complete with fold-out American maps, plates and early American state documents and battle accounts. See this and other rare books. 1750 Famous Porcupine Map of Halifax and many other historic maps of America and throughout the world are shown in our map section. 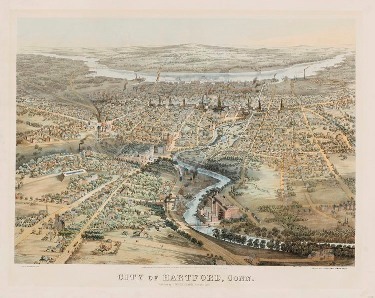 1864 Panoramic View of the City of Hartford, a rare lithograph by John Bachmann in spectacular condition can be seen with many other items of Connecticut historic memorabilia. 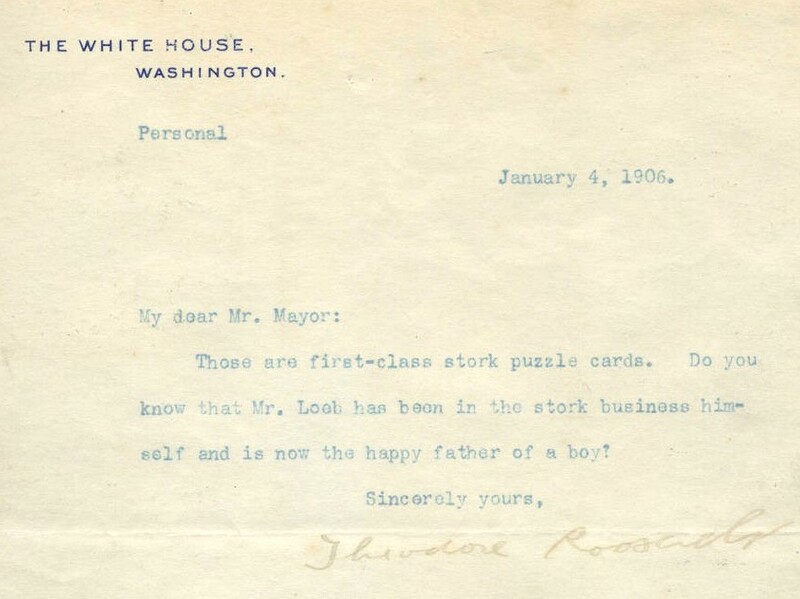 Theodore Roosevelt White House letter commenting on the birth of conservative New Hampshire publisher William Loeb See this document and other historic autographs here. 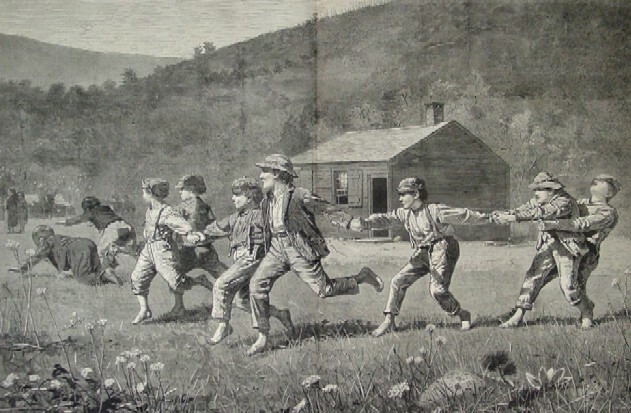 Antique historical prints such as this famous Winslow Homer wood engraving "Snap the Whip," 1800s historical prints of George Washington, Civil War print caricatures of Abraham Lincoln and many others populate our antique print section. 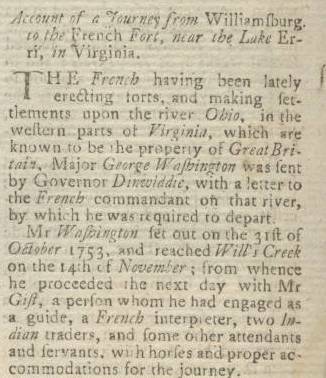 1754 Report of 22 Year Old George Washington's Military Expedition to American Interior. His first prominent public mention in British publication. View this and other historic newspapers and magazines. Chief Justice Oliver Ellsworth drafts this 1776 Revolutionary War document. More autographs, books, magazines and other legal related memorabilia are in the Law section of this web site. World War II home front war poster picturing Tuskegee Airman. See this and other World War 1 and World War 2 posters by clicking on the highlighted text. 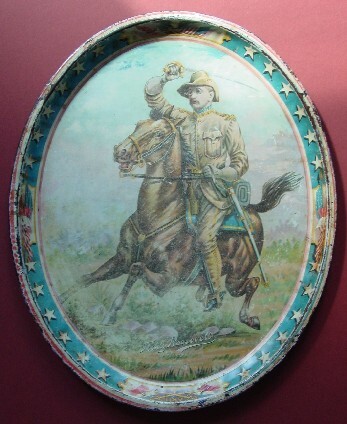 THEODORE ROOSEVELT DRAMATIC ROUGH RIDER TIN PLATE. See other items in the Historical Memorabilia section. William Howard Taft Political Ribbon. See other vintage political in our Political Memorabilia section. What's In The History Gallery Web Site? As the name suggests, historygallery.com offers graphical items such as antique prints, World War I and World War II posters and framed and unframed autographs. In addition we have all manner of political, legal and historical memorabilia and documents. We are avid readers and collectors of American history and offer a large selection of original historic newspapers and a select collection of antiquarian books related to American history, law and politics. In the latter category we specialize in the historical works of Edmund Burke, including those contained in the Annual Registers from 1758 until the early 1800s and the pamphlets and books Burke and his opponents wrote during the American and French Revolutions. Connecticut is the home state of History Gallery so we have a nice selection of Connecticut documents, autographs, prints and other historical and political memorabilia. We also have some miscellaneous items that may be of interest such as a large periodical library on microfiche with over 130 titles (including 43 years of Newsweek from 1957-1999) and two Russ Bassett microfiche cabinets. This site makes extensive use of pictures and descriptions and hyperlinks to external web sites so you can learn more about the historic events and individuals associated with the items we are selling. Survey after survey of graduates of elite American Universities document the appalling lack of knowledge of our nation's history. American history knowledge commonly taught before 1970 to elementary or high school graduates is apparently not known by many graduates of Ivy League universities. Many schools no longer view it as an essential function to provide students historical knowledge so that they may intelligently assume the duties of citizenship. And what American history schools do provide is often of the politically correct variety that seems designed to induce shame rather than pride in American ancestry (e.g., Howard Zinn's "A People's History of the United States" is one outrageous example). Despite this there is a very great demand for American historical knowledge and that demand is being provided by popular histories and biographies such as David McCulloch's 1776 and John Adams and historical novels such as the Sparrowhawk series by Edward Cline. The tangible historical memories of America and Western Civilization in the form of historical artifacts such as provided by this web site are in increasing demand and increasingly short supply. You can investigate History Gallery's inventory of American historical memorabilia and navigate the site by the hyperlinks on the top of every page or click on the featured items above to bring you to items of the same category. To learn more about us and this web site go here.